npm WARN lifecycle npm is using /opt/plesk/node/8/bin/node but there is no node binary in the current PATH. Use the --scripts-prepend-node-path option to include the path for the node binary npm was executed with. Add scripts-prepend-node-path=true into .npmrc file in Node.js Application Root folder. Using File Manager add scripts-prepend-node-path=true into .npmrc file. Create the file if it does not exist. Execute the following to configure the corresponding Node.js version. 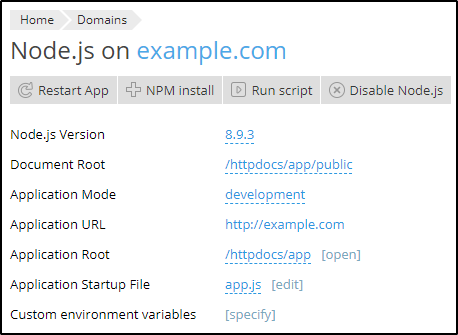 The example below shown for Node.js 8.